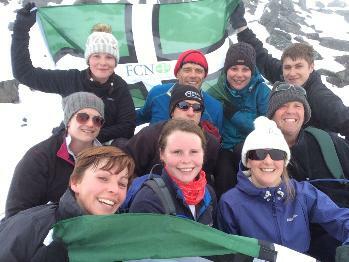 A group of six Devon Young Farmers and four volunteers from the Farming Community Network (FCN) have completed the Three Peaks Challenge. The team consisted of Emma and Georgina Davie from Newton St Cyres YFC, Jamie Packham and Alice Giles from Bow YFC, Devon YFC county organiser Nick Creasy, past county chairman Chris Berry, alongside Jo Jones, Colin Smallacombe, Sarah Pateman and Sara Holland from the FCN. The team worked together to reach the summit of Ben Nevis (1344m) in Scotland, Scafell Pike (978m) in England and Snowdon (1085m) in Wales – approximately 27 miles, all within 24 hours. The challenge involved extreme weather conditions on Ben Nevis where visibility was poor with sub-zero temperatures and snow. The team were then delayed by three and a half hours due to a fatal accident on route to Scafell Pike, but morale was high when the group started the hike with a full moon and completed it by sunrise. Despite the change of weather conditions and restriction of time, the group walked Snowdon at a fast pace, with seven of the team completing the challenge in less than 24 hours. Nick Creasy, Devon YFC County organiser, said "The group did a fantastic job in the extreme weather conditions, lack of sleep and setbacks which were out of our control. It was such an achievement and the team should be really proud of their hard work on the challenge." The challenge which was organised to raise money for the Farming Community Network on their 20th Anniversary and the Devon YFC building fund where the charity will be based was sponsored by local companies within Exeter and Mid Devon. The team would like to extend their thanks to the Mole Avon, NFU Crediton, Ag Bag, Daw Refrigeration, EBVC, James Pryce Tractors, Crediton Dairy, Cornish Mutual, Smallridge Brothers, North Park Vets, Haines Watts, Davisons, Cardens Estate Agents and Devon Sales & Lettings. Jo Jones, Devon FCN co-ordinator, said; "The challenge demonstrated how we both want to work together to support the future of farming. It was a tough challenge with many obstacles to overcome along the way, however everyone worked together and had a great time whilst doing it. The challenge was a lot harder than expected, but very rewarding and the money raised will go a long way to help others".